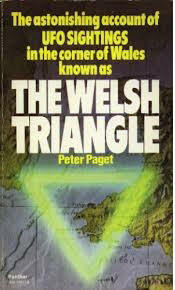 Close Encounters of UNUSUAL KIND IN WALES 1977- a ufo-contact that seemed to be a BIG experiment on teleportation - as 'something' teleportated the farm-cattles MANY times and about a lot of unaccountable incidents around the RIPPERSTONE farm and the involved family. This true story - was a BIG mystery. The uninvited left the Coombs family as dramatically and unexpectediy as they first arrived, but the mystery they brought with them remains. Only one thing seems certain - they were there.But, having shared the Coombs' experiences, you must judge that fact for yourself. I have related the story as accurately as was possible, spending weeks with the family, during which time each of them painstakingly relived their own experiences over and over again into a tape recorder. Their stories never varied. They all swear to the truth of what they have said, and have even offered to take lie detector tests to prove the validity of their experiences. Conclusions are therefore easy to reach. The choice is simple. Either their story is a carefully concocted web of lies, or it is a vividly accurate, carefully reconstructed account of probably the most significant close encounters on record. There can be no half-measures. I have absolutely no doubt which is the case. In the beginning, I was sceptical, and approached the family with a mind more closed than open. The experiences the family claimed to have had seemed to belong firmly within the realms of science fiction and that suited me admirably at the time, for I had been commissioned by a magazine simply to write a suitably dramatic. True-Life UFO Story to coincide with the opening in Britain of Close Encounters Of The Third Kind. It didn't matter whether the story was true or not, as long as it was topical and a 'good read'. At the outset, I had little doubt which it was likely to be. I am now sure I was wrong. things, nor had any interest in the subject (as I write this, not one member of the family has ever seen either Star Wars or Close Encounters 0f The Third Kind!) It originally took all my powers of persuasion to get them to tell their story at all, and they persistently refused all offers of payment to do so - as they do to this day - for fear of damaging their credibility. It was only a combination of their fear of the phenomena they were encountering; their anger at the lack of assistance they were getting in their plight; and their genuine concern that such things should be brought to the attention of the public that eventually convinced them to allow me to recount what happened. 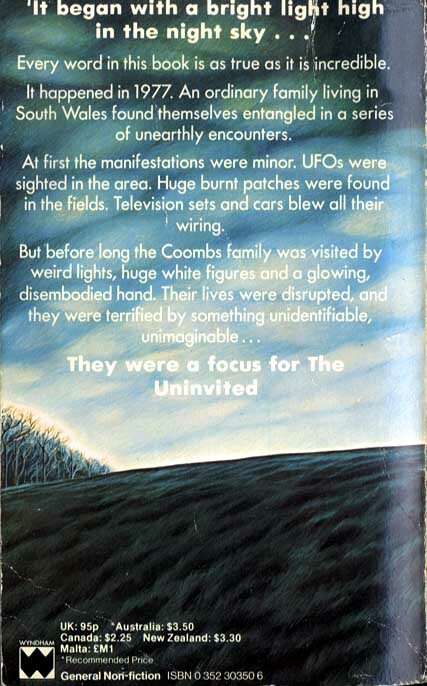 In connection with a major UFO wave over England in 1977 we brought in UFOASPEKT # 5 of the same year among others, a mention of the family Coombs' experiences. These have since been the subject of very detailed investigations, and after two years, there are now published a book titled ,,The Uninvited", - in which the author Clive Harold - painstakingly is going through all the strange experiences the family had. This is based on a longer article published in the National Enquirer August 7, 1979. Book was out-of-print when this was made online, in the purpose of bringing this case into the light again. 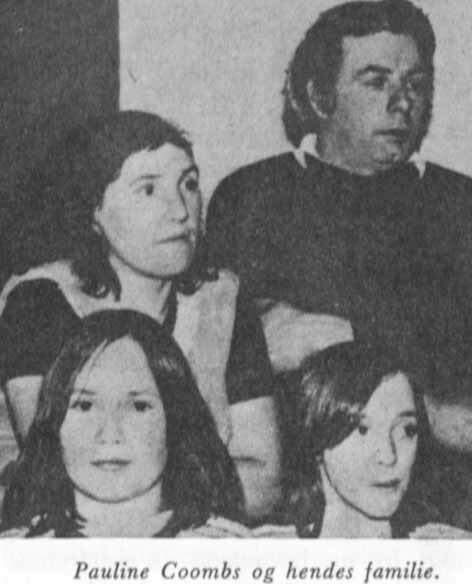 It all started in early April 1977, when Pauline Coombs along with her three children, was one day on the way home in their car. The family lived on a farm in Wales near ‘the little Heaven¨. At one point, they saw a yellow luminous object, about the size of a football, which approached the car, and then following them the last few miles of their home travel, after which it disappeared. Almost completely paralyzed with fear, the couple now saw outside of their living room window, the outline in silver and luminous, a humanoid figure of incredible dimensions. The window was 2.10 meters high, but despite this, they could only see the body, arms and the lower part of the head of this “man”. Or what did they really see? Was it there a helmet, behind which hid a blurred face? Mrs. Coombs was about to faint. When the couple had collected themselves for a moment, they decided to call for help. Mrs. Coombs went upstairs to calm the kids while Billy would try to reach the phone to call the police. But then he remembered the dog Blackie, as none had seen or heard anything from. It was usually a good guard dog, so why not let her chase figure away? Billy found the dog in the hall where it clingy had crept into a corner. Although its teeths was exposed, and the hairs bristled on all sides, but he managed to finally get the dog outside. But the attempt was futile, for hardly had the dog come out before it howling and with tail between legs, was running down the road away from the house. After slammed the door firmly behind him, Billy realized now that there was only one option, namely the phone. But it meant that he had to get into the room where the figure stood outside the window. And it was still there. When Billy came into the room, the figure lifted one hand and placed it on vindusglasset, which then began to vibrate at a stunning speed. At the same time, all lights in the house started raising to flash, and with trembling hands, it finally succeeded for Billy getting turned the police number. But shortly before two police officers appeared, the figure disappeared. The police were now told the whole strange experience, and to Mr. And Mrs Coombs' amazement, the officers were very interested. They could in fact say that a vast number of UFO sightings, had for some time been reported to police, and that several colleagues had even seen unidentified flying objects. On top of this agonizing game, the family Coombs only desired one thing: peace and quietness. But what they on this time did not know, was that the actual event was only a foretaste of what would later to come. In the fellowing weeks - there was a wide variety of strange and bizarre things happening, such as multiple observers of the mysterious figure, UFO sightings and strange behavior among the farm animals. The parents were first somewhat suspicious to the children's story, but as they are all - a little later - reached the place, the kids had appointed, there was no longer any doubt. The grass was burnt and flattened, and it was seen a clear and large footprint, which among others, were leading to the rack. Pauline was quite convinced that these images were not made by humans. Each footprint was about 60 centimeters long and it took her two steps to get from one to the next. After these initial events, nothing seemed to be impossible. But to the family Coombs, every new event came as a shock. In the next step, was the center of attention shifted partly to the fields where cows grazed and partly to the farm buildings where the animals were the night. Over a few weeks, Billy noticed that the cows became more and more agitated. Several times they had suddenly begun to kick violently in the ground, seemingly without any reason, and one day they went so as crazy. With great danger of being badly mauled, the whole crowd run through the barbed wire fence – as well electric fences, and then settled down on the adjacent field. One evening Billy wanted to ensure that everything was in order before he went to bed. The cows were in the stables, and only after one hour, had he examined each stall and found everything satisfactory. Subsequently, the large iron gates were securely locked. But hardly had this happened, before Billy heard the phone ring inside the farmhouse. He rushed in to take it, and to his great astonishment, the owner of one of the neighboring farms told him that his fields with crops was almost completely destroyed after a large herd of cows had raged around. Billy came of course from his stables, so he denied immediately that it could be his, but when the neighbor then told him that the cows all had Billy's green and yellow marks in the ears, and then he did not further knew what to belive. As the phone was laid down, he immediately went out to the stables, to find that the locks were intact, but ... when the gates were opened, all the stalls were empty. Only the freshly strewn straw was left. These disappearances continued over again the next few months and only ended when the UFO sightings finally stopped. But then, were a total of five cows vanished without a trace, and the rest were each picked up at different places in greater or lesser distance from Billy's farm. Finally, we will at look probably the most remarkable event of them all, namely Pauline Coombs’ strange encounter with two UFO- pilots the day before the long series of events finally ceased. Mrs. Coombs had gone to bed and tried to fall asleep when her attention was caught by a small light. It seemed to be focusing on treatment for her and seemed almost mesmerizing. The only thing she sensed, was the light that was reflected from the pillow, and the outline of her hands and arms as she held crosswise. - Hey! What was it? A mysterious thing turned out. It looked like a transparent plastic tube with a kind of metallic pipe at the end. It placed itself now on her forearm, and suddenly had the metal tube pierced in her arm. Pauline then suddenly felt transported out of the room. Mrs. Coombs immediately thought it was a dream, but was this the case? It felt so real -everything. She had the right nightgown, and besides, she could still taste the cacao as well as the cigarette, she briefly before had enjoyed. So she had to concentrate and look around. The next, Pauline Coombs sensed was that she sat on a bench. A long bench made of what looked like white plastic, which was cast into the equally white plastic-wall, she leaned against. To the left of her, stretched both bench as the wall itself forward in a wide semi-circular shape. (seems to have been inside a circular ship-rø-rem) She found herself in a dome-shaped space aboard a spacecraft hovering over the farm. At the end of the long bench, Pauline saw a huge screen or whiteboard, which filled all the opposite wall. The screen was filled with flashing lights that seemed to flash in a certain pattern: red, blue, yellow and green, and so on. But what was on Mrs Coombs right? She at first felt only a black, shadow-like emptiness. But there was still something. Was it figures. No! And yet. Well, now they were moving forward. Slowly they approached her, then stopped, still hidden by dusk. They stared at her without blinking an eye. Two beings at the same height, with the same shape and appearance. She did not need to be afraid. She sensed that so strong, she said. But how? Mrs. Coombs just knew. The more the figures stared at her, the more she knew that fear was unnecessary. No, she had no reason to be afraid, and also felt she had to go home. Pauline sensed already that she was heading back to her room. Shortly after this experience, the family Coombs had foreign guests for the last time. The family was on their way back to the farm, when they suddenly saw a strange light in the sky. It was heading toward their home, but then disappeared from sight. But when they got home, the light was there again. No one in the car said a word. It was as if everyone expected it to be there, as if it/they were waiting for them. Hanging completely still over the stables housing and directly in front of the family, this strange spherical object lighted the night sky with its orange lights; a light that had the same intensity and the same size as the Sun. Continued without saying a sound, rose the family out of the car and walked slowly down the gravel road with the stares directed at the shining sphere. Pauline was the first to break the trance-like silence. ,, Beautiful, is it not?" She whispered and continued:,, Is it not that the most beautiful thing I've ever experienced?" No sooner had she said this, before the giant ball started to move; slowly, swaying first to one side, then the other, as a shining pendulum, which issued its orange glow in a perfect bow on the muddy ground beneath their feet. For a brief moment, the object stood silent in the sky, and then with runaway speed, disappearing up - until it eventually was no longer visible. book on the case- pdf with some pictures, as it was out-of-print when this was made online, in the purpose of bringing this case into the light again. 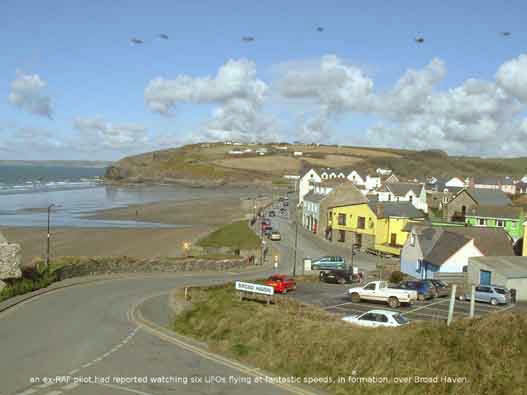 During 1977, a fairly remote area of the west Welsh coast was subjected to an extraordinary amount of Ufo sightings, landings and reports of 'aliens'. The national and local British press had a field day, running witnesses accounts that were written at best 'tongue -in-cheek,' and at worst, cruelly vindictive. This is the true story of the Coombs family and their harrowing experiences over a twelve month period from mid January to mid December 1977. Whether they encountered true paranormal phenomena or unknown laws of physics applied by aliens, is open to conjecture. Maybe the two are one and the same. What is known by Clive Harold, who wrote The Uninvited, from which much of this account is taken, is that the Coombs could not have been a more honest, hard working farming family. They knew nothing about Ufology, shied from publicity and sought no financial gain. Some Ufo groups blamed the Coombs experiences on a fertile imagination, whilst others offered unequivocal support. In this rather isolated area of Wales there were (in 1977) a number of high security if not top secret, military establishments: RAF Brawdy, RAE Missile Range Army Pendine Tank Range and an American Navy submarine hacking station. Ufo's were reported over these bases and it is known the military were involved in some 'rather unusual activities' and searches. But the sheer number of sightings over a twelve month period would suggest more than a modicum of interest from a higher intelligence. Perhaps there was an anthropological/ ecological survey, surveillance, monitoring, testing or what you will. But then any 'wave' or 'flap' of Ufo 's may be just this. To human logic and reasoning, many of these so-called 'higher intelligence activities' border on the absurd. The actions themselves may not have been frightening, but the unknown and the loss of control generate the fear and apprehension. 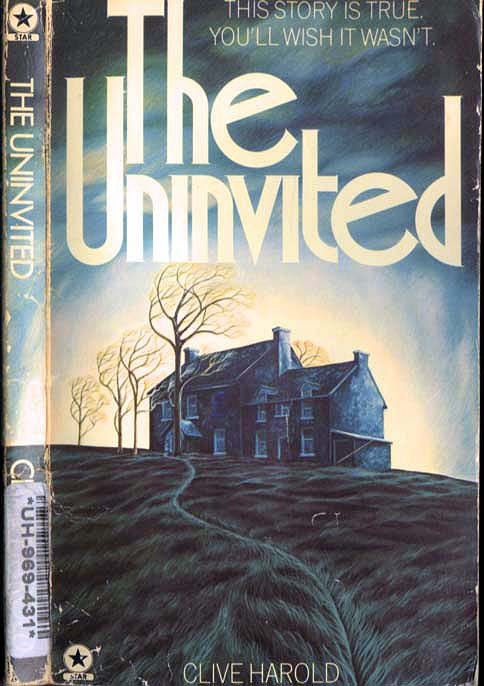 This story should not be confused with The Uninvited 2 by Frank Taylor 1984. His account relates to the Ellis family of Matlock, Derbyshire who experienced a series of events in many ways similar to the Coombs, but in other ways more sinister. 14th January 1977. Hanging motionless over the field near the cliff top, a great ball of incandescent light transfixed Pauline's gaze. With so much military activity in the area she had seen many lights in the sky over the years; flares, rockets, planes - but this was different. Twenty minutes later it started to move, gently at first, swinging side to side like a pendulum. Then it dropped out of the sky to disappear below the cliff. Pauline's husband was asleep in his chair. She shook him awake and related what she had seen. Curious, he put on his boots and headed out in to the cold night to search the cliff top path for whatever it was that came down. He found nothing. Pauline remained troubled by her sighting. The next day the papers were full of Ufo reports. Billy had laughed off the suggestion that Pauline's 'light' was a flying saucer. But he added that there were some strange things going on. 'There were nigh on fifty frogmen below the cliff. Unmarked army trucks, soldiers in camouflage. Navy there too' he added, 'building the same path beneath the water. Doesn't make sense'. Pauline was thirteen miles from home. Her twins, Layann and Joann were in the back and Keiron her youngest son in the front. Her thoughts wandered to her family-the nightmares Layann had been having lately, dreaming of a shadowy figure in her room . Twice this had happened. Twice Layann woke up screaming, and on each occasion the TV set had burnt out its wiring. In fact two TV's and two cars had succumbed electrically, scores of light bulbs had exploded and they'd lost count at the number of blown fuses. Even Clinton, her eldest son had complained of strange humming noises outside the bathroom window which seemed to enter and fill the whole room. Pauline's reverie was broken by Keiron calling for her mum to look into the night sky. There it was. Back. She tried to dismiss it as 'just another star. But Keiron insisted it was swaying side to side. Her thoughts turned again to the fifty people who had reported Ufo's to the police recently. There were the two schoolboys who had seen a domed Ufo with pulsating green and yellow lights hovering over an office block in Haverfordwest. The same boys had approached a blue light in a field near their school which rose up and sped away when they approached. 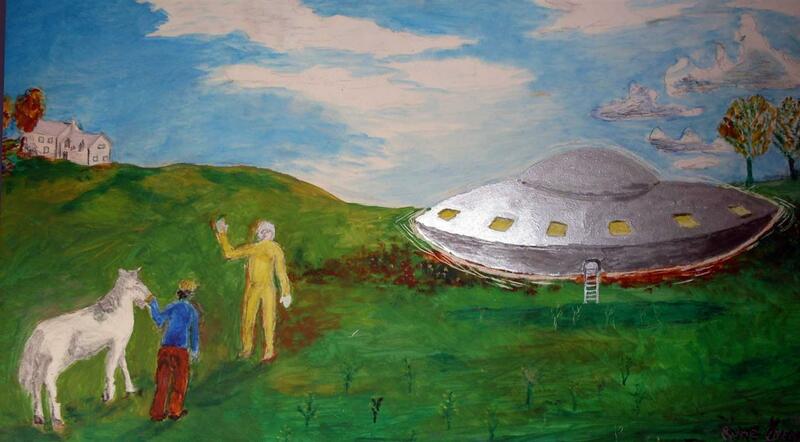 Even more strange were the fourteen school boys who saw a landed Ufo near their school. Two of the boys reported seeing a silver figure near the craft. All reported ten or eleven windows and a sort of runway leading from a door. 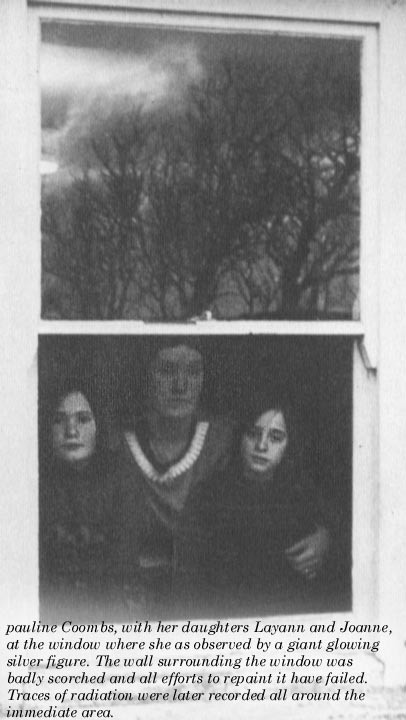 But the next ten minutes were filled with fear, as the family raced for home through the night. The light had descended and headed for the car on a collision course. At the last second it shot over the top to disappear in the distance. But their relief was short-lived when Keiron announced it had stopped, turned round and was coming back. The twins had woken up and were soon on the verge of hysteria. Pauline raced the car down the last stretch of hill leading to the farm, the orange light pacing them to her right. Suddenly the car lights dimmed and the engine died. But they were almost home. She pushed the frightened children out of the car. They ran the last few yards to the security of the farmhouse, their (incredulus) father and Clinton. And still the fuses blew, three televisions and three cars, all lost their wiring. No engineer, electrical or mechanical could explain what was happening, except that there seemed to be a huge drain of power from the house. The meter dials would speed around when everything was turned off. But this was just the start of a series of extraordinary happenings. The following Friday their dog Blackie became very restless, sniffing and whining around the house extremely agitated. Pauline and Billy settled down on the sofa to watch a late movie. Billy soon fell asleep and Pauline was constantly distracted by a flickering light in the window. An hour later it was still there. Billy jumped up grumbling that someone's headlights had woken him up. 'JEEZ' he exclaimed. 'What's that? WHAT IS THAT!?' There at the window was the shimmering figure of a man. A huge, silver- suited figure over seven feet tall, unmoving, staring. Where the face should be, just blackness.Watching. Waiting? Where was Blackie? He must get help. He found the dog a whimpering heap in the hall. As he approached the dog bared its teeth, hackles rising. Billy grabbed it by the collar and sent it out of the house to guard. But it streaked away from the house as fast as its terrified legs could take it. The figure at the window raised a gloved hand to the glass which started rattling at an incredible speed. As this happened, the lights dimmed and the television 'went on the blink'. Billy composed himself enough to call his neighbour Robert Morrison and the Broad Haven police. A while later he heard the police siren approach. He fixed his frightened gaze on the figure at the window. It just vanished. The following morning they had found a scorched rose bush in the flower bed and huge, footprints beneath the window. The papers had got hold of the story, the last thing that Coombs had wanted. They had also run another story. Robert Morrison's wife Julia had seen a jelly mould shaped Ufo in the garden near their farm house, fifteen feet high and fifty feet across. After ten minutes, it rose silently into the air and flew off - and Julia, with double honours degrees from Reading University was not prone to fantasise. After reading the paper, the phone rang. Pauline answered it. Rosa Grenville, her friend from the Haven Fort Hotel across the bay was on the line. What she said next made Pauline's hair stand on end. The previous night, Rosa had looked out of her bedroom window very late. There in a field at the back of the hotel was a huge saucer-shaped thing with a dome on top. It was radiating light. Two tall, human-like creatures came out of it and started bending down looking at the ground. "They didn' t seem to have faces " related Rosa, "Just black spaces. They were there about twenty minutes.They got back into the craft and took off at tremendous speed - in your direction"
Billy had troubles of his own on the farm. With the cows. Clinton could not get them into one of the fields. When Billy finally did, the cows behaviour bordered on panic. He was amazed to find a fifty foot circle of burnt and flattened grass. The cows wouldn' t go near it. The following Sunday, the twins had burst into the house, almost hysterically. They had seen a tall, silver suited man with a blacked out face glide across the bottom field, arms unmoving. In the corner of the field was an enormous silver Saucer-shaped thing with lights, windows and a ladder of sorts coming from a door. Billy was furious with the twins for making up such a story. Pauline, tired of being in a constant state of fear, donned Billy's coat and headed for the door, determined to find the truth. The twins, Tina, their older sister and Blackie followed in hot pursuit. Pauline's findings had sent a collective chill down their spines. There was a huge circle of flattened grass and a giant footprint at least two feet in length. From that print ran a trail of others. It took two of Pauline's paces to bridge the distance between two giant tracks. The twins had been telling the truth. Pandemonium soon followed as the twins yelled to their mother to come quickly. Blackie was acting totally demented, going round in circles, snarling and growling. Tina and Joann had just seen a silver disc take off and dive into the water near Stack Rocks. Another circle of flattened grass lay in front of them. What did this all mean? The whole family grew more alarmed. Something was going on and they seemed to be directly implicated. Most of the national and all of the local newspapers were 'knocking on their door' so to speak, and BUFORA had sent down investigators to sift through the events and make a report. That night, when Billy and the kids had returned their grandmother and Tina to Milford Haven, Pauline had seen the figure again, just beyond the lawn at the front of the house. It moved around, tall, silver and glowing. A fear had welled up within her. As she watched, transfixed, the figure simply disappeared - went out, like a light bulb. Sleep came quickly that night, but Pauline overslept. When she did get up, feeling terrible, her arm was in agony and her eyes all swollen and puffy. They stung dreadfully as if sleep hadn't come for a week. Joann had a rash on the side of her foot and Layann on her leg. 'Not the children too' begged Pauline inwardly. But she got a further shock the next day when her mother phoned. Layann, who was staying with her grandmother, to avoid the apprehension on the farm, had had a dream of waking up in her mother's bed. A glowing disembodied hand had floated through the door and across the room. It came over to her mother, touched her arm and drifted slowly out of the room again. On hearing this, Pauline s only thought was to leave the farm as soon as possible before it was too late. It took a week for the twin's rashes to heal and three weeks for Pauline's eyes to get better. (Remember Mona Stafford's terrible eye condition from the Jan. 1976 Liberty, Kentucky encounter - BR) Blackie, the Coombs dog had to be put down. His dementia increased to such a degree, he spent most of his time growling, snarling, howling and chasing his own tail. Reports of Ufo's were still coming in. A council worker saw 'a large Ufo hovering over an office block, with a silver 'alien' floating nearby, at 5am in the morning An RAF officer reported a Ufo travelling at one thousand miles per hour. One day in June, Pauline had returned to the farm from a fancy dress party. She had found Clinton in a distressed condition. He related what had happened. Looking out of the window he had seen the strangest silver car ever, come up the drive. In it were two men in black suits. One got out and approached the farm. He seemed to float along. Clinton wouldn't answer the door. He felt something was wrong. Carol, living in the adjacent cottage three minutes walk from the farm had seen the visitors arrive. She thought how strange there was no scrunching of the gravel when the car drove up. As she put some rubbish into her dustbin, she was shocked to find the visitor standing next to her. She had seen him at the farm only twenty seconds before. It would have taken at least three minutes to get to her cottage, and yet here he was with a strange waxy skin, high forehead and sleeked- back black hair - and those cold unblinking eyes....He had asked for Pauline by name. Carol told him she did not know where Mrs Coombs was and turned to go in doors. Next thing the man had gone, vanished! But there he was in the same instant back in the car moving up the drive. 'You must have passed him Pauline, on your way in' said Carol. But she hadn't. But then an even more inexplicable thing happened. Pauline s friend Rosa, highly distressed, called from her hotel, north of Broad Haven. Her daughter Anna, a university student was alone at the hotel. She had looked out of the window to see an enormous silver car in front of the hotel. But why hadn' t she heard it on the noisy gravel drive. Two men were in the car and it was their physical appearance that frightened Anna the most. Her description of the one that came to the hotel was the same as Carols. He had asked for her mother and when would she be back. After that they left and Anna insists we would have passed them on the drive an our way back to the hotel. "But we passed nobody" wailed Rosa. "They just vanished in thin air, I tell you"
I enclose a copy of a letter I have received from the Ministry of Defence following the representations made on your behalf but I'm afraid this sheds no light on your encounter. Yours sincerely, Nicholas Edwards, MP. My department have investigated the report about an unidentified Flying Object which you have referred to me on behalf of Mrs Rose Grenville at the Haven Fort Hotel. I regret to say, however, that although an RAF officer has visited Mrs Grenville, we are unable to offer any further information. It is true that the Royal Observer Corps have a post in the adjoining field, but there is no evidence their activities could have seemed unusual in any way and we have no record of any other unusual activity in the area. Parliamentary Under Secretary of State for Defence. This is an astonishing reply, given that over one hundred independent witnesses had reported Ufo's and at least a dozen had seen landed craft and associated occupants. The papers all over the country had run endless stories on bizarre encounters and the more mundane 'lights in the sky.' If the Under- Secretary's reply is to be believed, then the security of British air space let alone national security is in serious doubt. July and August passed without incident. The Coombs were beginning to think their lives were getting back to normal. Billy reflected on what some of the Ufo researchers had said - that one of their family could be psychic, attracting Alien intelligences to investigate further. It was Pauline, he thought, who had first seen the light in the sky, the figure at the window. It was the foating hand in the bedroom that had touched her arm, which suffered a while. Pauline had been away working for two months at a local factory and all the odd happenings had stopped. But had they? A lot of things had gone missing lately. Now he couldn't find the cigarettes. Small sums of money disappeared, only to reappear later in the same place. Two cardigans had vanished, never to show up again. It had been a hard day ploughing under a hot sun. Billy looked forward to a shower, cold drink and relaxation. He headed back to the farmhouse wondering what had happened to Keiron. He found him near the house, sullen and withdrawn. 'What's wrong son?' he had asked. Keiron went on to relate that he had headed for the house to get a drink, but didn't go inside. There in the front room he saw, through the window, a tall dark, fluid-like shape moving about. It totally unnerved him. Shortly after Keiron described what he saw to his father, Pauline and the kids came home. They enjoyed a good dinner that evening, and after the kids had gone to bed settled down for a relaxed evening of television. But the television wouldn't work. Billy's worst fears were realised. Whatever it was, was back. November 12th turned out to be one of the most significant for the Coombs family. After spotting a daylight disc and watching it perform some elaborate aerial manoeuvres before plunging into the sea near Stack Rocks, Pauline had had enough. She decided to investigate and defying Billy's protestations, strode off in the direction of the disappearing Ufo with the kids in tow. They arrived at the cliff top not knowing really where to look for the Ufo. Below them, Stack Rocks loomed ominously up from the depths. What they saw next bordered on fantasy . There on the Rocks were two figures in silver one-piece suits. Eight, ten, twelve feet tall? One was lower than the other picking something up. Impossible! But there it was, clear for all to see. A door. A door in the face of the rocks. One of the figures emerged from the opening and made its way down to the other figure at the water's edge. They moved round the Rock base, came to an inlet which blocked their progress, and seemed to glide across to the other side. The family watched, disbelieving as the two tall figures climbed back up the Rock and disappeared through - of all things - a doorway. .And as they watched, the 'doorway' lightened and faded away leaving only cold grey stone. Pauline and the children headed back to the farm deep in thought. What had they really seen? To make matters worse, Rosa had phoned. Rosa related how she had been looking at Stack Rocks through her binoculars when a silvery Ufo came into view and dived into an entrance on the Rock. A short time later, silver-suited figures came out of the opening in the Rock, climbed down to the sea and back again several times. There is no explanation to Pauline and Rosa's visual synchronicity. It happened on three or four occasions and left both women emotionally drained. After this event the whole cow herd disappeared from locked sheds and paddocks b reappear two kilometres away on two occasions, in a matter of minutes. Three cows vanished altogether. On the 19th december, the family headed back to their farm after visiting relatives in Broad Haven. It was a clear cold night. Thirteen miles from Dale they saw it . A bright yellow light streaking across the sky. It stopped, moved back and dropped down to tree-top height. The farm came into view. The family got out of the car, and there over the cow shed was an enormous ball of orange light. They had almost expected it, and this time without fear made their way towards the glowing orb. Pauline thought how beautiful it looked. "Watch" she said. And at that the light swung like a pendulum, stopped for a moment and shot up into the night sky. It had gone and the Coombs sensed it would not be back. From this moment, the inexplicable events at Ripperstone come to an end. No doubt, in the fullness of time, Ufo researchers will re-open this case. It may well become another classic that refuses to die, like Roswell, Rendelsham, Boainai, Socorro, Vallensole and a host of others. Or it may be relegated to the 'too hard basket' and end up as just another folklore tale. I forbindelse med en større UFO-bølge over England i 1977 bragte vi her i UFO­ASPEKT nr.5 samme år bl. a. en omtale af familien Coombs' oplevelser. Disse er senere gjort til genstand for meget indgående undersøgelser, og efter to års forløb er der nu udgivet en bog med titlen ,,The Uninvited" (de uanmeldte), hvori forfatteren Clive Harold minutiøst gennemgår alle de sælsomme oplevelser familien har haft. Bogen er endnu ikke kommet redaktionen i hænde, hvorfor efterfølgende omtale er baseret på en længere artikel offentliggjort i National Enquirer den 7. august 1979. Pauline Coombs og hendes familie. Det hele startede i begyndelsen af april 1977, da Pauline Coombs sammen med sine tre børn en dag var på vej hjem i bil. Familien boede på en gård i Wales i nærheden af little Haven. På et tidspunkt fik de øje på et gulligt lysende objekt, cirka på størrelse med en fodbold, som nærmede sig vognen, for derefter at følge dem de sidste par kilometer til deres hjem, hvorefter det forsvandt. Den næste begivenhed indtraf sidst i april 'måned, og den blev starten på en lang række dramatiske oplevelser. En aften, da fru Coombs sad og så TV, medens hendes mand Billy lå og sov, blev hun pludselig distraheret af et flimrende lys, der kom ind gennem vinduet. Billy vågnede kort efter, og da han gik ud fra, at der var tale om et par billygter, som på generende vis havde bidraget til hans bratte opvågnen, besluttede han sig for at se efter, hvem det kunne være. Men næppe havde Billy vendt ansigtet mod vinduet, før han blev grebet af rædsel. Medens han rejste sig, hævede han afværgende armene op foran ansigtet som for at beskytte sig mod en angriber, og idet han vaklede hen mod sin kone, udbrød han: ,,Du milde himmel, hvad er det? Næsten helt lammet af skræk så ægteparet nu uden for deres stuevindue omridset sølvfarvet og lysende menneskelignende skikkelse af utrolig dimension. Vinduet var 2,10 meter højt, men trods dette, kunne de kun se kroppen, armene og den nederste del af hovedet. Eller hvad var det de så? Var det en hjælm, bag hvilken gemte sig et udvisket ansigt? Fru Coombs var nær ved at besvime. Da ægteparret havde sundet sig et øjeblik, besluttede de sig for at tilkalde hjælp. Fru Coombs gik ovenpå for at berolige børnene medens Billy ville forsøge at nå hen til telefonen for at ringe til politiet. Men da kom han i tanke om hunden Blackie, som ingen hidtil havde set eller hørt noget til. Den var normalt en god vagthund, så hvorfor ikke lade den jage skikkelsen bort? Billy fandt hunden i entreen, hvor den klyngende var krøbet ind i et hjørne. Selv om den tender var blottede, og hårene strittede til alle sider, lykkedes det ham til sidst at få hunden udenfor. Men forsøget var nytteløst, for neppe var hunden kommet ud, før den hylende og med halen mellem benene løb ned ad vejen bort fra huset. Efter at have smækket døren forsvarligt efter sig, indså Billy nu, at der kun var én mulighed, nemlig telefonen. Men det indebar, at han skulle ind i den stue, hvor skikkelsen stod uden for vinduet. Og den var der stadig. Da Billy trådte ind i stuen, løftede skikkelsen ene hånden og placerede denne på vindusglasset, som herefter begyndte at vibrere med en fantastisk hastighed. Samtidig begynte alt lys i huset at blinke, og med rystende hænder lykkedes det til sidst Billy at få drejet politiets nummer. Men kort før to betjente dukkede op, forsvandt skikkelsen. Politiett fik nu fortalt hele den besynderlige oplevelse, og til hr. og fru Coombs' store forbavselse var betjentene meget interesserede. De kunne nemlig fortælle, at et utal af ufo-observationer gennem længere tid var blevet indberettet til politiet, samt at adskillige kolleger selv havde set bl. a. uidentificerede flyvende objekter. Oven på denne sindsoprivende omgang ønskede familien Coombs sig kun én ting, nemlig fred og ro. Men hvad de på det tids-punkt ikke vidste var, at den aktuelle begivenhed kun var en forsmag på, hvad der senere skulle komme. I de efterfølgende uger skete der en lang række mærkelige og bizarre ting, såsom flere iagttager af den mystiske skikkelse, UFO-observationer samt mærkelig opførsel blandt husdyrene. Forældrene var først noget mistroiske over for børnenes historie, men da de alle lidt senere nåede frem til det sted, børnene havde udpeget, var der ikke længere nogen tvivl. Græsset var afsvedet og fladtrykt, og man så tydeligt de store fodaftryk, som bl. a. førte hen til hækken. Pauline var helt overbevist om, at disse aftryk ikke var lavet af mennesker. Hvert fodaftryk var cirka 60 centimeter langt og det tog hende to skridt at nå fra et aftryk til det næste. Efter disse første begivenheder syntes intet at være umuligt. Men for familien Coombs kom hver ny begivenhed alligevel som et chock. I næste omgang blev begivenhedernes centrum flyttet dels til markerne, hvor køerne græssede, dels til staldbygningerne, hvor dyrene overnattede. Igennem et par uger havde Billy bemærket, at køerne blev mere og mere ophidsede. Flere gange var de pludselig begyndt at stampe voldsomt i jorden, tilsyneladende helt uden grund, og en skønne dag gik de så helt amok. Med stor fare for at blive slemt tilredt, for hele flokken lige igennem såvel pigtråds- som elektrisk hegn, for derefter at falde til ro på den tilstødende mark. En aften ville Billy sikre sig, at alt var i orden, før han gik i seng. Køerne befandt sig i staldene, og først efter én times forløb havde han undersøgt hver enkelt bås og fundet alt tilfredsstillende. Herefter blev de store jernporte forsvarligt låst. Men næppe var dette sket, før Billy hørte telefonen ringe inde i stuehuset. Han skyndte sig ind for at tage den, og til sin store forbløffelse kunne ejeren fra en af nabogårdene fortælle, at hans marker med afgrøder var næsten helt ødelagt, efter at en stor flok køer havde raset omkring. Billy kom jo lige fra sine stalde, så han benægtede straks, at det kunne være hans, men da naboen derefter fortalte, at køerne alle bar Billys grønne og gule mærker i ørerne, vidste han ikke længere sine levende råd. Da røret var lagt på, gik han straks ud til staldene for her at konstatere, at låsene var ubrudte, men... da portene blev åbnet, var alle båse tomme. Kun det friskstrøede halm lå tilbage. Disse forsvindingsnumre fortsatte gang på gang de næste måneder og ophørte først, da UFO-observationerne endelig standsede. Men da var i alt fem køer sporløst forsvundet, og resten blev hver gang hentet forskellige steder i større eller mindre afstand fra Billys gård. Til sidst skal vi se på den nok mest bemærkelsesværdige hændelse af dem alle, nemlig Pauline Coombs sælsomme møde med to UFOnauter dagen før den lange række af begivenheder endelig hørte op. Fru Coombs var gået i seng og forsøgte at falde i søvn, da hendes opmærksomhed med et blev fanget af et lille blændende lys. Det syntes at focusere på hende og virkede næsten hypnotiserende. Det eneste, hun sansede, var det lys, der blev reflekteret fra hovedpuden, samt omridset af sine hænder og arme, som hun holdt over kors. - Hov! Hvad var det? En mystisk ting viste sig. Den lignede et gennemsigtigt plastikrør med en slags metalrør for enden. Den placerede sig nu på hendes underarm, og med ét havde metalrøret prikket hul i armen. Pauline følte sig pludselig transporteret ud af værelset. Fru Coombs troede straks, det var en drøm, men var dét tilfældet? Det føltes så virkeligt altsammen. Hun havde den rigtige natkjole på, og desuden kunne hun stadig smage såvel den cacao som den cigaret, hun kort for inden havde nydt. Så hun måtte koncentrere sig og se sig godt omkring. Det næste, Pauline Coombs fornemmede, var, at hun sad på en bænk. En lang bænk lavet af noget, der lignede hvid plastic, og som var støbt ind i den ligeledes hvide plasticvæg, hun lænede sig mod. Til venstre for hende strakte såvel bænk som væg sig fremefter i en bred halvcirkulær form. Selv befandt hun sig i et kuppelformet rum ombord i et rumfartøj, der svævede over gården. For enden af den lange bænk bemærkede Pauline en enorm skærm eller tavle, som fyldte hele den modsatte væg. Skærmen var fyldt med blinkende lys, der syntes at blinke i et bestemt mønster: rød, blå, gul og grøn, og så fremdeles. Men hvad var der på fru Coombs højre side? Hun fornemmede i første omgang kun en sort skyggelignende tomhed. Men der var alligevel noget. Var det skikkelser. Nej! Og dog. Jo, nu bevægede de sig fremad. Langsomt nærmede de sig hende, men standsede så, stadig skjult af halvmørket. De stirrede på hende uden at blinke med øjnene. To væsener på samme højde, med samme facon og udseende. Hun behøvede ikke at være bange. Det fornemmede hun. Men hvordan? Fru Coombs vidste det bare. Jo mere skikkelserne stirrede på hende, jo mere vidste hun, at frygt var unødvendig. Nej, hun havde ingen grund til at være bange, og desuden skulle hun hjem nu. Pauline fornemmede allerede, at hun var på vej tilbage til sit værelse. Kort tid efter denne oplevelse så familien Coombs de fremmede gæster for sidste gang. Familien var på vej tilbage til går den, da de pludselig fik øje på et mærkeligt lys på himlen. Det havde kurs mod deres hjem, men forsvandt så ud af syne. Men da de nåede hjem, var lyset der igen. Ingen i bilen sagde et ord. Det var, som om alle forventede, at det skulle være der, ligesom for at vente på dem. Hængende helt stille over staldbygningerne og direkte foran familien, oplyste denne mærkelige kugleformede genstand nattehimlen med sit orange lys; et lys, der havde samme intensitet og samme størrelse som Solen. Fortsat uden at sige en lyd steg familien ud af bilen og gik derefter langsomt ned ad grusvejen med blikkene rettet mod den lysende kugle. Pauline var den første, der brød den trancelignende stilhed. ,,Smuk, er den ikke? ", hviskede hun og fortsatte: ,,Er det ikke det smukkeste, I nogensinde har oplevet?" Næppe havde hun sagt dette, før den gigantiske kugle satte sig i bevægelse; langsomt, svajende først til den ene side, så til den anden, som et lysende pendul, der udsendte sit orange lysskær i en perfekt bue på den mudrede jord under deres fødder. Et kort øjeblik stod objektet stille på himlen, for derefter med voldsom hastighed at forsvinde opad, indtil den til sidst ikke længere var synligt. ,,Du har hele tiden vidst det, ikke sandt? Men hvordan?" Hun fortalte derefter alt, hvad der var hændt den foregående nat. Men da Billy sagde, at det hele jo kunne være en drøm, forblev Pauline tavs. Hun drak blot sin the og smilede for sig selv. Men idet hun gjorde dette, kunne de andre ikke undgå at bemærke den plet, der - som efter et kanylestik - var på hendes under-arm... .
Ripperston Farmhouse UFO Phenomena – The British Roswell? Although the UFO activity seen at Ripperston Farmhouse happened some time ago (1977), it is probably one of the most important events seen in Britain, and whilst it is not as famous as the Roswell incident many years earlier, it certainly warrants a great deal more attention. My brother, Nigel Brockwell, has had an interest in UFO’s and the Paranormal for many years and was taking a holiday in Wales when he read about Ripperston Farmhouse. He had decided on a more scenic route for his return journey and this took him close to the farm. Not knowing what response he would receive, he decided to call in at the farm for a chat with the occupants. He was greeted by Mrs. Pauline Coomb who invited him in, and she introduced him to her husband, Billy. What struck Nigel the most was the couple’s apparent honesty about the information they were giving, and their lack of interest in profiting from the story (quite a rare thing nowadays). It should be pointed out that the UFO activity around the farm was not a one-off event, but a series of experiences that occurred between mid January and mid December 1977. Although the Ripperston farm is situated in a rather isolated area of South Wales, there were (are) a number of high security (perhaps top secret) military bases close by. According to the records, UFO’s were reported over these bases and the military were involved in some “unusual” activities and searches. The Ripperston Farmhouse story began on the 14th of January 1977, when Pauline Coomb saw a “great ball of incandescent light, hanging motionless over the field near the cliff top”. It was not unusual to see strange lights in the sky (because of the military activity), but this was different. After approximately twenty minutes the light started to move, swinging from side to side (much like a pendulum), as it got nearer to the ground and disappearing below the cliff. Pauline woke up her husband (who was sleeping in a chair at the time) and he went to the cliff top path to search for whatever the object was. Unfortunately, he found nothing. Clinton, Pauline’s eldest son, commented on a strange humming noise coming from outside the bathroom window which would enter and fill the whole room. Two schoolboys claimed to have seen a dome shaped UFO with “pulsating green and yellow lights” hovering over a building in Haverfordwest. They also approached a blue light in a field near their school, which flew off at speed when they got nearer. Fourteen other schoolboys also saw a landed UFO near their school and a “silver” figure near the craft. They described the craft as having ten or eleven windows and a kind of ramp leading from a door. One Friday evening, as Pauline and Billy were watching a movie on television, Pauline was distracted by a flickering light in the window, and the whining of their dog Blackie. The light was still there after an hour, and Billy (who had fallen asleep) was woken by what he thought was car headlights. He then noticed a “shimmering figure” of a man at the window. The figure was wearing a silver suit and apparently seven foot tall. It didn’t move and just seemed to be staring inside. Billy commented that there was only blackness where the face should have been, and it sounded as if the man at the window was wearing a helmet with a shaded visor (much like astronauts would use). A little while later the figure at the window raised a gloved hand to the glass, which started to rattle. At the same time the lights dimmed and the television stopped working. Billy managed to call his neighbour and the police, and when the police siren could be heard approaching the farm, the figure vanished. A newspaper reported a sighting involving a “Jelly Mould” shaped UFO in a garden near the farm, which was said to be fifteen feet high and fifty feet wide. Shortly after reading this in the newspaper, Pauline’s friend, Rosa, telephoned to say that she had seen a dome shaped UFO in a field near the hotel where she worked. It produced a light and two tall, human like, figures got out and appeared to be searching for something on the ground. The description of the figures seemed to match the one seen at Pauline and Billy’s window. Rosa said the figures returned to the craft after about twenty minutes and it flew off at great speed, in the direction of the farm. Sightings of dome shaped UFO’s and figures in silver suits continued, and on one occasion the Coomb’s son, Keiron, claimed to see a “tall dark, fluid-like shape” in the front room of their farmhouse. However, a sighting on the 12th of November was perhaps the most bizarre of all. After seeing a UFO (in the daytime) perform some spectacular manoeuvres, it suddenly plunged into the sea by the famous Stack Rocks. Pauline took her kids with her to investigate this further from the cliff tops, and on the rocks below she saw two figures in silver suits, who she estimated to be between eight to twelve feet tall. She noticed a “door” in the rocks, where one of the figures emerged and they moved around the base of the rock. After the figures returned through the door, it faded away and could no longer be seen. On returning home, Pauline received a call from her friend Rosa. Apparently, she had been looking at Stack Rocks with her binoculars and saw a “silvery” UFO fly into an entrance on the Rock. Sometime later silver-suited figures came out of the opening in the Rock and climbed down to the sea and back again several times. After one more sighting on the 19th of December 1977, the UFO activity came to an end at the Ripperston Farmhouse. Did these events really happen? It would certainly seem so, but whether this involved Aliens or advanced military equipment and personnel we cannot say for sure. Considering these events happened more than 32 years ago, and not that long after the moon landing, it seems unlikely that the military would have such crafts. We can only assume that a more advanced race was responsible for these sightings, and were working with the knowledge of the military. If this is true, it supports the belief of a cover-up and indicates how long this has been going on. It also asks the question of why this is being kept a secret. Do aliens want to keep their presence a secret from the general public, or do some of our leaders insist on this (for personal gain)? The fact that people are still reporting UFO sightings might suggest that if aliens are involved, they are not that worried about being spotted. However, the authorities take a much more defensive role and make every effort to keep information from us. It would be nice to think the authorities have our interests at heart in keeping this information secret, but knowing the government and politicians as we do, that is very unlikely. There is a growing feeling on the internet that something “major” is about to break shortly on the subject of UFO’s and Aliens, and my personal view is that this will be good news, although maybe not for everyone.